We have taken many of our books to the next level by creating stunning and exclusive special limited editions. Working with some of the world's best printers we have produced luxury leather-bound books, books in real cloth slipcases and books that sit neatly in a bespoke presentation box to create that extra special 'collectable' feel. "Wimbledon: The Official History was the fourth book produced by the All England Club by Vision Sports Publishing. All have been superbly designed, and the quality of the finish has been first class. We are especially delighted with the limited edition of the above volumes, which are bound respectively in green and purple leather and presented in a leather-bound slipcase. They look magnificent and are certain to become collectors' items." In 2012 we produced a special limited edition of John Barrett's official history of Wimbledon, a two leather-bound book set in purple and green within a leather-bound slipcase. 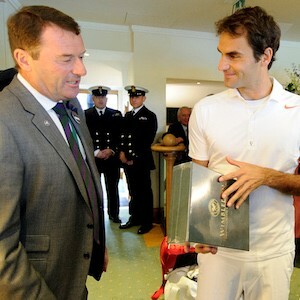 Only 750 copies were manufactured, with some of the copies being presented by the All England Club to former champions and special guests at The Championships. For Wasps' 150th anniversary in 2017 we produced a limited edition version of our Official History book which was contained in a real cloth slipcase adorned with the official badge for the centenary season, embroidered with the same thread as used on the players'shirts. Only 500 copies were produced, with each copy individually numbered and signed by Wasps legend Lawrence Dallaglio. In 2016 we produced 500 special limited edition copies of our official 1966 World Cup anniversary book. Each book had a bespoke, numbered page inserted at the front which was personally signed by Geoff Hurst, the legendary striker who famously scored a hat-trick in the final.